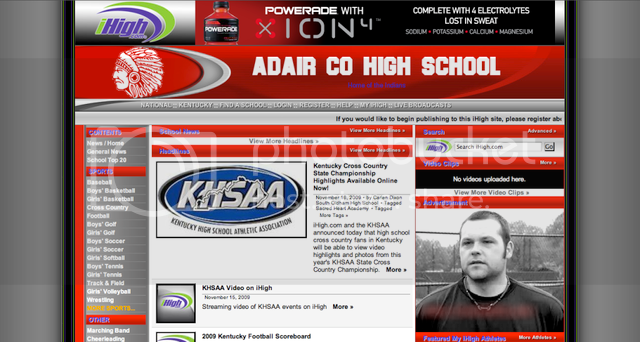 The land grab to broadcast high school and local youth sports online is heating up. We previously profiled YourSports.com and Wazoo Sports. Now it's iHigh's turn. Rather than crowdfunding events as YourSports plans to do, iHigh provides each school with a free website that allows users to follow sports statistics, activity schedule searches, and support a particular school via online commerce and advertising. iHigh shares in the advertising and promotional revenue. iHigh receives the bulk of its traffic from high school and college students along with their families and friends that want to know what's going on. The company expects that 10,000 sporting and school events from nearly 2,000 schools will be streamed live or on recorded video on iHigh.com this year. iHigh has also secured an affiliation with the National Federation of High Schools. iHigh also plans to create off-field opportunities for students such as providing aspiring announcers with the opportunity to broadcast games, cheerleading squads with the opportunity to show their videos and marching bands with the opportunity to showcase music. The Lexington, Kentucky-based company says it has managed online and offline promotional campaigns for marketers including the United States Navy, US Marines, the Student Loan Finance Corporation, Dodge, National City Bank and others. Given the desire of brands to market to innately local audiences and the parental/administrative friction to doing so in high school environments (i.e. don't except to see jersey ads anytime soon), it stands to reason that online live broadcasts of high school sports and surrounding social media could provide a cost efficient and less intrusive sponsorship opportunity for reaching the 70 million strong Gen-Y demographic and parents throughout the country.